Shocks and disturbances are inevitable in any system. Communities can be vulnerable to extreme weather events, market fluctuations, migration, and other forces. While we cannot prevent these things from happening, we can build more resilient systems that withstand pressure, and avoid the type of critical damage from which communities cannot recover. But what does a resilient system look like and how do we build one? 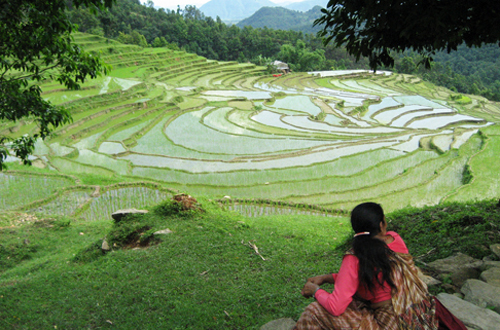 Several years ago, Bioversity International partnered with the United Nations University-Institute of Advanced Studies of Sustainability (UNU-IAS) under the Satoyama Initiative, and developed a set of indicators – 20 questions to help communities analyze the resilience of socio-ecological production landscapes (SEPLs). These indicators are spread over four broad categories: ecosystems and biodiversity protection; agricultural biodiversity; knowledge, learning and innovation; and social equity and infrastructure. Results from the indicators can be used to develop strategies to enhance resilience in a community and their landscape. “One unusual thing about our indicators is that rather than focusing on eco-biological traits – species, habitats etc., they are more holistic, and emphasize the need for strong institutions to support communities and enhance resilience,” says Pablo Eyzaguirre, lead scientist of the Bioversity research team. This inclusion of social and economic aspects also works well with communities: “They find the link between conservation and socio-economic issues more relevant for them,” says Diana Salvemini, coordinator of UNDP’s Community Development and Knowledge Management for the Satoyama Initiative (COMDEKS) project, which has been piloting the indicators in 20 countries since 2011.